I continued last Monday 6/17 to check each Max Restaurant Group location off my list of restaurants-to-visit, and got to attend a five-course wine dinner at the same time. 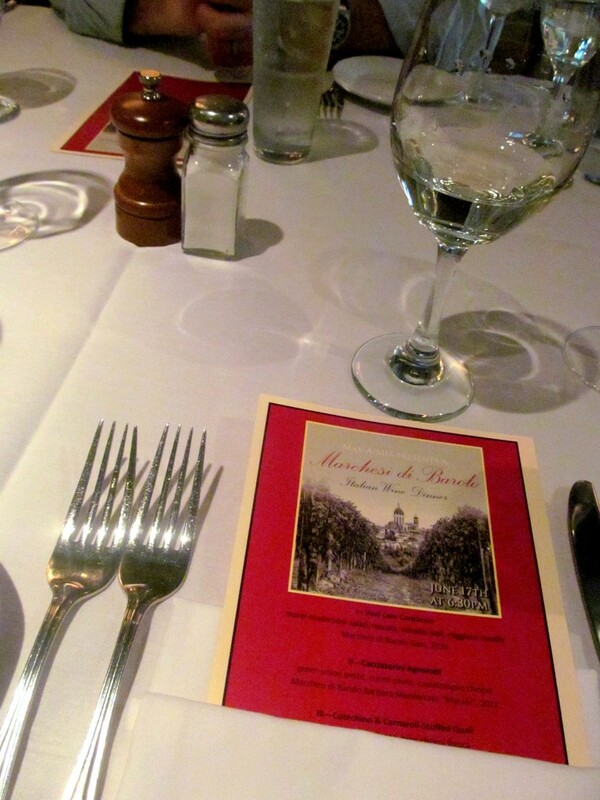 Two birds (one a quail…) were killed with one stone with my participation in the Marchesi di Barolo Italian Wine Dinner at Max A Mia, the restaurant group’s location in Avon, CT. Though originally scheduled for the patio, the dinner was moved inside after both an overwhelming amount of people wanting to attend (I’m sure partially due to the very reasonable $68 price tag) and a storm that rolled through shortly before the 6:30PM start time. I was disappointed to arrive and find I would not be dining outside since the weather cleared right up after the storm, but unlike most restaurants, Max A Mia’s interior was not frigid and actually delightfully warm. I attended the event with my good friend Jeff and we were seated with two super-nice business partners and friends, Bob and Tim. I told them about this blog and gave them my card so in case they are reading this, hello Bob and Tim! No time was wasted in pouring us the first wine which was nice, because I’ve been to events that didn’t TRULY start until up to half an hour after the stated “start time”. We started with a white made from Cortese grapes, called Gavi. It was the perfect fitting to a summer event and would have tasted even better on the patio, but I still enjoyed it…so much so that it was tough to hold off on drinking it and save it to pair with the first course! 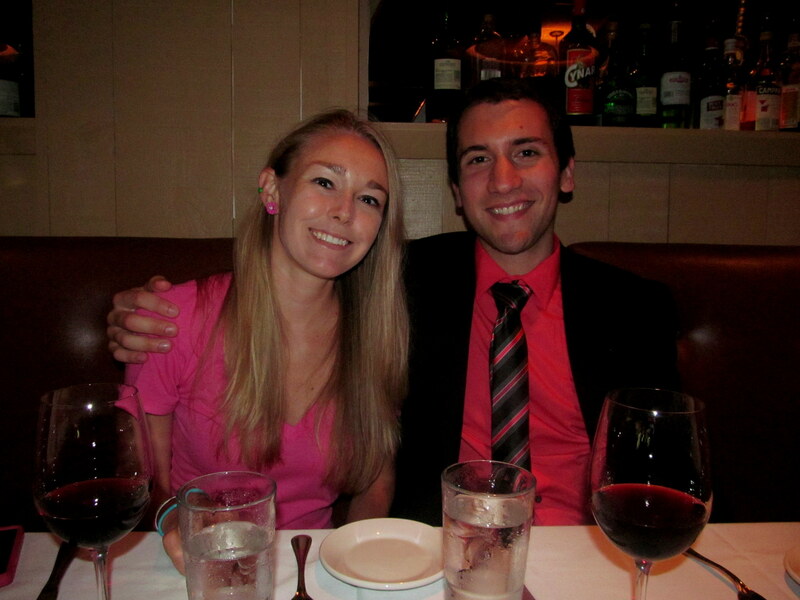 But I’m glad I did, because pairing the different wines with different dishes is the most fun part of these dinners. One of my favorite parts of Max Restaurant Group tasting dinners is the moment when each dish is first placed before me, because its menu description usually involves at least one component I have never heard of, making it difficult to get an expected picture of the dish in my mind before seeing it. 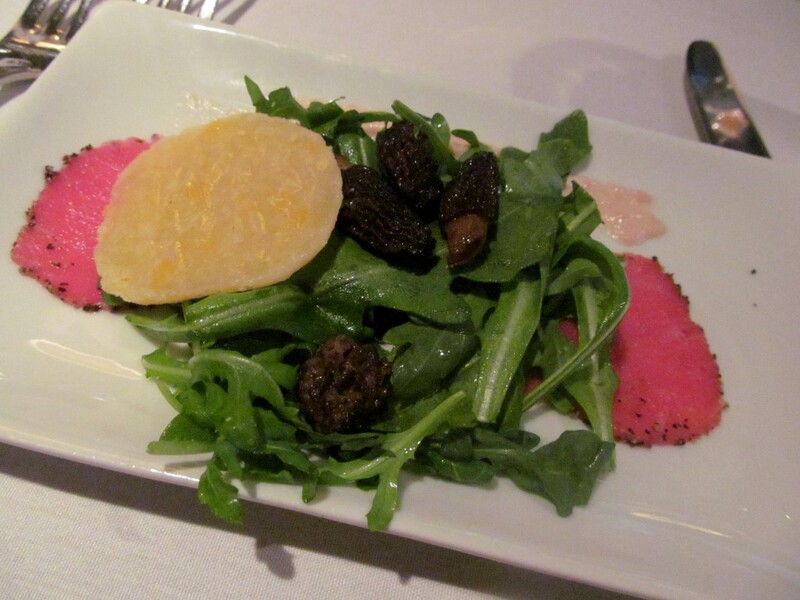 A perfect example is the above first course – what is a morel mushroom? What is tonatto? Did you know Reggiano is the same as Parmesan? Did you know ruccola is Italian for arugula? By the way, if someone would like to box up cheese cookies, I’m sure I’d be done for. What would make the ultimate cheese plate? CHEESE COOKIES! I wanted about a thousand more of them, and the veal just tasted so wonderful on top. The portion of arugula was pretty generous (yay!) for a dish of this small size. Meat, cheese, greens, veggie…I was destined to enjoy this combo. I was a little disappointed by the second wine, Barbera Monferrato Maraia, because I was hoping it’d taste as good as one of the best affordable reds I’ve ever had (another Barbera). This one tasted closer to Pinot Noir (too light) to me, but luckily a few knowledgeable distributor reps were circling the room throughout the night to give us a side of education with our wine, so I was able to ask about the difference in taste from other Barberas of my past. The rep told me he wasn’t surprised this one seemed lighter bodied given the region it came from, and it’s true that it was a good way to ease from red to white! It just so happened that though the wine was not my favorite, the pairing of the wine with the second course was my favorite pairing of the evening. Whenever I adore a pasta dish, it’s something special. The homemade cheese-and-sausage stuffed, pesto-smothered pasta paired beautifully with the Barbera, thanks especially to the presence of the salty olives. I love when I can actually taste the freshness in grated cheese. Marvelous. The next course, paired with the more robust Dolcetto d’Alba Madonna di Como red wine, had me super excited because I’d never had quail before! It didn’t taste that different than other meats I’ve had before, but I appreciated the chance to try something new. The stuffing disappointed me though. I didn’t find any cotechino (similar to salami), just a whole lot of carnaroli (medium-grained rice). And while I adore polenta, I felt the dish had a bit too much of it. The best part, better than the quail, was the bing cherry fresca. That made a dynamite combo with the red wine! 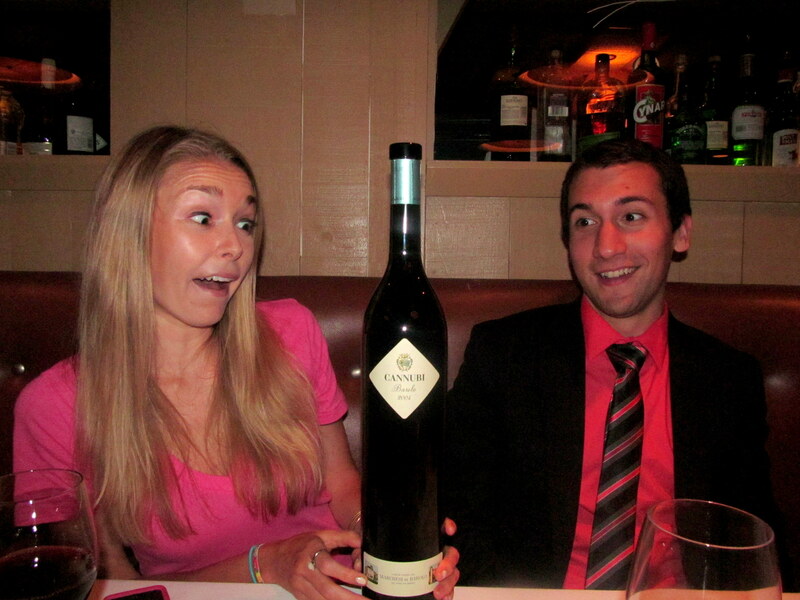 Get a load of that next wine!!! 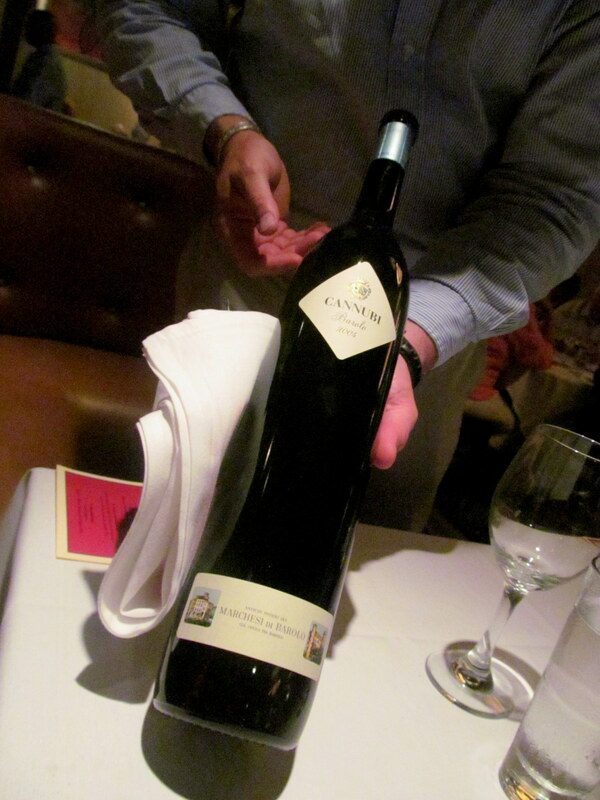 I’ve never experienced wine poured from a magnum size bottle before. The Barolo Cannubi is 100% Nebbiolo grapes and based on its tasting notes, I predicted it’d be my favorite stand-alone wine of the evening. I was right; I adored the big body and bold flavor combo of licorice, spice, and oak. I’m definitely more into this staged pic than Jeff is. Fun fact – oxtail is the tail of cattle. Another new-to-me protein to try during course four! Unfortunately my oxtail portion was smaller than the rest of my tablemates’ portions, but Jeff was nice enough to give me some of his. What a delicious meat! So flavorful and I also adored the horseradish greens. Dr. Bob said he could’ve done with less but I wanted MORE! The dish had lots of grains like the last course, but this time I enjoyed it because I loved the texture of the spatzle and the way it soaked up the marrow demi glaze. Last but not least – dessert! I was wary of the final wine, Moscato d’Asti Zagara, but there sure is a difference between cheap and quality Moscato. Though I still do not prefer sparkling white dessert wines, I have to admit this one was the perfect pairing for the sweet food, which cut down on the wine’s sweetness when I paired them together. Dr. Bob also noted that he detected a little kick to the nutella brodetto, at the end of each taste. I ended up emailing Chef David Stickney to ask him about Dr. Bob’s suspicion, and he confirmed – he did add a pinch of cayenne! Nice taste buds, Dr. Bob! I only wish we’d been given more crunchy (exterior) and soft (the fruit itself) dipping materials. I had plenty of sauce left after I finished dousing the apple slices (left) and cherries (hidden, to the right). Jeff and I were frantically trying to scrape it up but we didn’t have spoons to do so…the forks sure made it difficult but we did the best we could. Leave no Nutella droplet left standing! Overall despite a couple of “I wish this had more of _____” moments, it was another fantastic Max Restaurant Group event and the $68 price tag was definitely more affordable than some of their others. I also am more ready than ever to return to Max A Mia so I can order a unique cocktail and some sort of delectable seafood dinner or flatbread! And of course, dine on the patio. 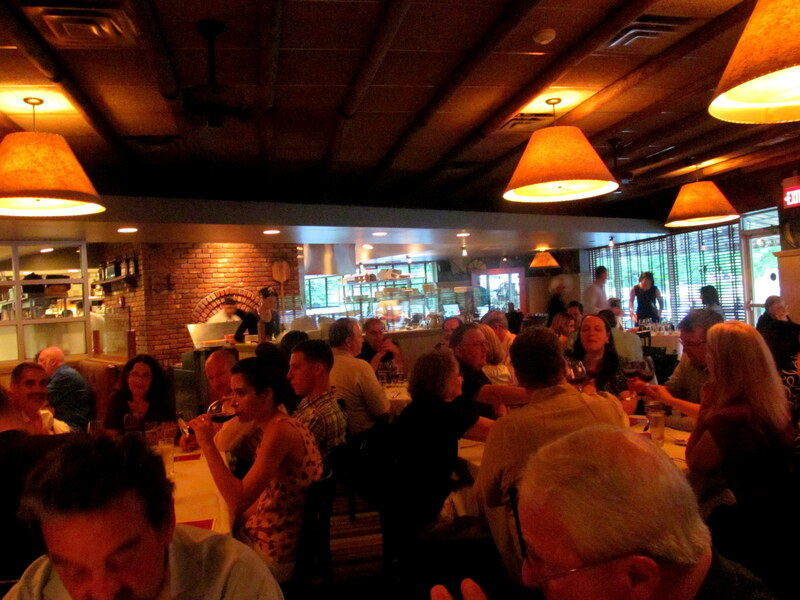 A little bird has also informed me that there will be another wine dinner on Monday 7/15…with food and wine of Tuscany! My eyes and ears are peeled for more info! Thanks to Chef Stickney, the rest of the Max A Mia staff, and Brescome Barton Distributors for some great food and wine pairings! Which of the five courses would have been your favorite? What do you usually order when you visit an Italian restaurant?